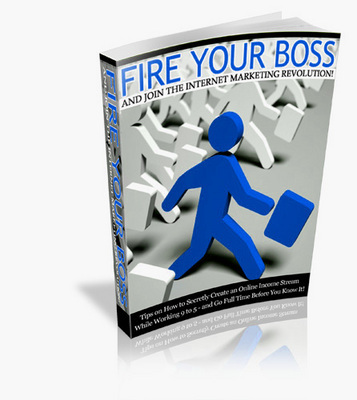 Fire Your Boss and join the internet marketing revolution! Tips on how to secretly create an online income stream while working 9 to 5 - and go full time before you know it! Most people would like to start a home business. They like the freedom of being able to work whenever they want to or wherever they want to. However, it is not easy to get there because many of them are stuck in a rut! They feel that they are controlled by their bosses. They feel that it would take too much time. Some of them even whine that they are too tired to do anything the moment they reach home! Whatever your excuses may be, you will most probably find the solution in this book (or at least, know what it takes to get started). The fact that you are able to pick up this book and read it shows your initiative and you should congratulate yourself for taking the first step! The Internet is a place that is filled with endless possibilities. It is very easy to find a business model that makes money for anyone as long as they put in the effort to learn and work hard. All that it takes is that you believe in yourself and believe that you will be able to free yourself from the shackles of your 9-5 job and you will be able to find the means to achieve it. After all, if you want something badly enough, you will go all out and find the means to achieve your goals. This is just an all around good read.